Today was the 50th anniversary of the first of three Selma-to-Montgomery Marches. Some have recently come to call it "Bloody Sunday" (although there are many other historical events associated with this name). On that day, Alabama State police and a posse attacked the marchers with billy clubs and tear gas. Today President Obama and many others commemorated the bravery and sacrifice of the marchers. George W. Bush was also in attendance. 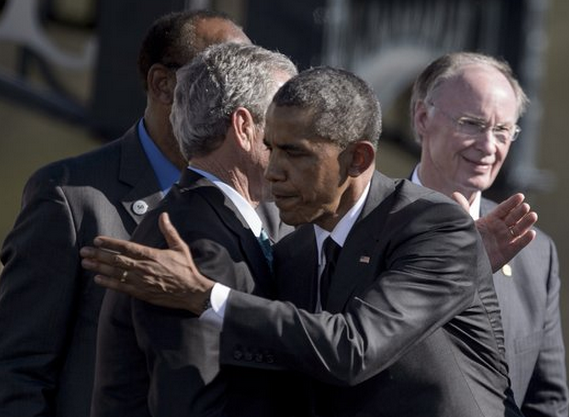 In the two accompanying successive images, President Bush and President Obama can be seen embracing. While it surprises no one that these two don't have affection for each other, this moment does provide some great nonverbal signals of such INSINCERE hugs. The specific type of touching on the back is crucial and can be further nuanced by its duration and the degree of palmar contact. When a hug consists of hands patting each other on the back rather than a prolonged touch - it can be signaling a social discomfort for public displays of affection - or a preoccupation with an underlying anxiety from another cause - or it's signaling a diminished or even complete lack of affection. A common nonverbal seen increasing in the last two decades is the hand-shake melded with a brief embrace - which George Bush and Barack Obama are doing here. Although President Obama is taller, he is leaning significantly towards President Bush - this fairly dramatic greater distance and separation along with their hands/arms blocking/insulating each other from contact - are all very strong indicators of a greatly diminished or complete lack of affection. Notice also President Obama's jaw - it is clenched very tightly. Barack's lips and midface are very tense as well and his eyebrows are pulled together and directed downwards. Of course we can't see President Bush's face - yet it's very probable his is conformed similarly. This facial expression-cluster - in particular his clenched jaw in the midst of a hug, invalidates any feigned affection in this moment. But perhaps the most profound body language tell here (seen in the lower image) can be seen when Barack's hand does make contact President Bush's back - his thumb fails to touch as the other digits do. The thumb must participate in order for a hug to be sincere. 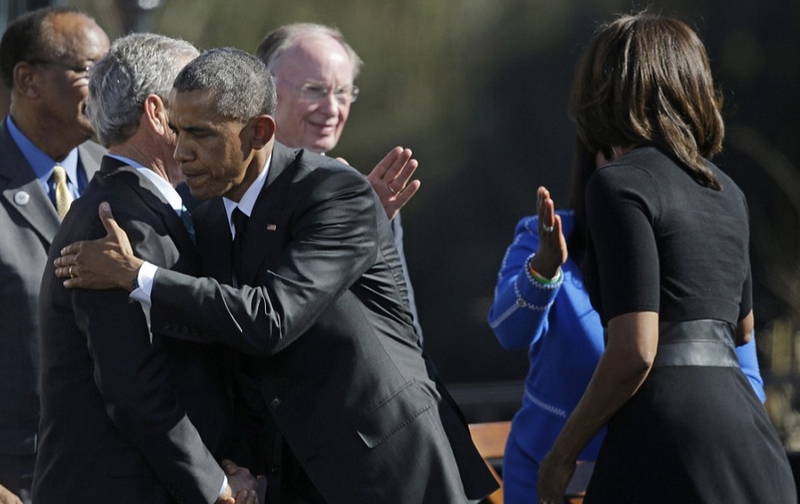 What other key nonverbal signal seen here tells us that this hug is insincere?